I have seen firsthand the monstrosity that Catalyst puts in communities. Visiting with family yesterday in Bucks County, I saw it, the stories high sign that is in place is horrific. It’s a monument to bad ideals and corporate greed. I was so disappointed that the area I grew up in looks like this. Pattye, if you haven’t seen it in person yourself, I encourage you and your readers to take a look at it. Thanks so much for bringing awareness to this issue. We do not want Catalyst putting up signage, especially since the township sees no return of the revenue. Agree and hope that the community comes out en masse on Thursday, April 25, 7 PM at the township building. 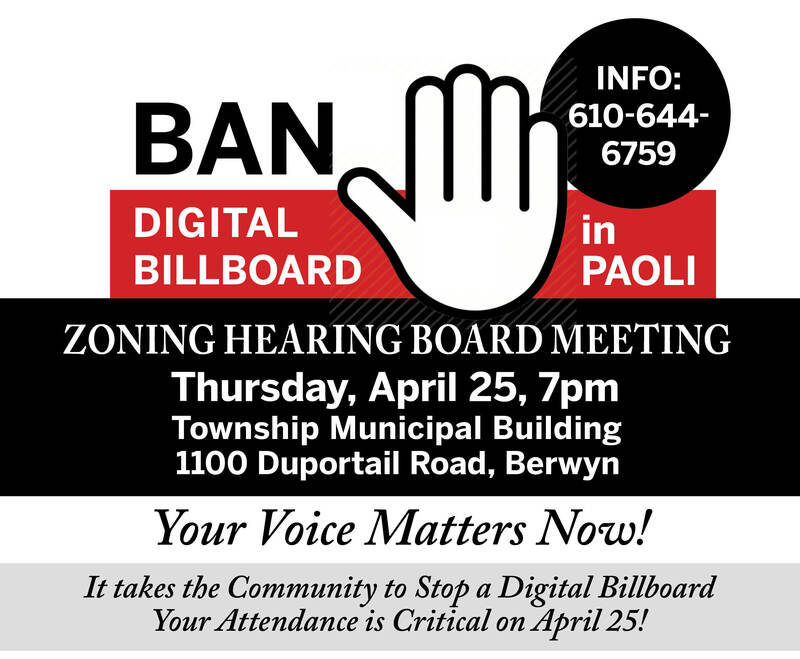 Residents need to send an extremely loud message to the Zoning Hearing Board that we do NOT want the digital billboard! I’ll be there April 25th. Carolyn, I am so sorry! It is remarkable that actually used photos of their Rt. 202 sign in their presentation at the Tredyffrin Township Board of Supervisors meeting — viewing this as something the residents would want to see in Paoli at the Rts 30/252 intersection. Somehow calling the two giant billboards a ‘Memorial” sign with its stonework and reflecting pool was supposed to make us want it! As a neighbor of to Catalyst’s Rt. 202 sign, your first-hand account is invaluable — thank you for sharing it! As School Board Director in the top rated Unionville Chadsford School District, can you give some insight on what you think about the way our Business Manager and Board are conducting themselves through the budget process. How does it compare to the way your Board of Directors operates? Former UCF Director Keith Knauss has stated your Business Manager is more transparent. Thank-you and good to know other Board members from around the area read Community Matters. The Supervisors will sit up and take notice of a large, animated crowd. They like the perks and power the special interests give them, but when push comes to shove they want to stay in office. That is threatened if they anger too many voters, so it is critical to get a very large and vocal group to the meeting. Bring your family and friends. I will. Who could be possibly be so worked up by the residents opposition that they would run around stealing over 100 signs!! I can’t imaging there are any residents who are for the digital billboard so the thefts, esp with the risk of being caught stealing them ,is a bit perplexing. Agree that it’s perplexing. Sadly, a tremendous amount of police and resident’s time was spent on trying to track down the thief(s). More BAN signs will be appearing over the next 10 days but the thief(s) should be aware we’re watching!